My husband and I wanted to write to you to express how pleased we have been with the service provided to us by Grant Simmons. He took the time to learn about our needs and our likes and was never pushy at all, which we appreciated very much. Once Grant understood what we were looking for, he provided us with options and encouraged us to test-drive the cars. We have been to a few dealerships in our quest for our dream car, and have not been impressed with the service of any of the salespeople we have come into contact with. That is, until we met Grant. He even included our two children in the conversations so they never felt out of place. You have a true gem of a team player there, and we hope you don't ever lose him. Grant at Westside was my salesperson and if it wasn't for his patience and understanding I may not have perservered with finding the right vehicle for me. Job well done Grant. I would like to say thank you for the professional, courteous and friendly manner I received from your company today when having my car serviced. It all worked perfectly and I loved driving the X5. Chris in the service department was absolutely lovely to deal with. I was actually in labour and had to stay in hospital and couldn't drive for 6 weeks. At no extra cost Chris organised for my car to be dropped back to me. Thank you Chris and thanks to all the team that worked on the car! Chris is an absolute superstar, he is beyond excellent. If not for him, I may use a more convenient dealership for me but as long as Chris is around I will be a patron of Westside. It is so wonderful to bring my car somewhere where I have been able to develop such a good and trusting relationship with my service advisor. My wife and I have recently been increasingly interested in purchasing our first ever BMW. We had pre-approval for the loan and decided we could do what we had looked at for quite some time. Whilst we test drove and fell in love with one of your cars, unfortunately we could not make the deal that we had hoped for and reluctantly had to let it go. I would like to say, despite not being able to make this happen, your staff and the experience we had in the Westside BMW dealership was nothing but a pleasure to us. Originally upon my first visit to your premises, I arrived in fairly untidy work clothes and was surprised by the manner in which I was treated. Even after mentioning that in all honesty I was merely "tyre kicking" and that I was happy not to take up the salesman's time, I was offered to be shown around and any questions would be gladly answered. The lady from reception offered to make a coffee or tea should I care for one and I was impressed to say the least. My wife and I made many a visit to view the cars at night or after work so as not to be an imposition. When I managed to talk my wife into joining me to take a look at one of your vehicles while there were sales staff present, we were again met with both pleasant and helpful people who treated us with a great deal of respect. I wish to take this opportunity to compliment you on your fantastic staff and the approach with which they conduct their work and the people they encounter. Although we could not do what we set out to achieve, I can unequivocally say that should our situation change we will be returning to your dealership to complete such a deal. This would be largely due to the excellent staff and the manner with which we were treated. Especially I would like to mention Grant Simmons and a gentleman who's name escapes me from my first visit. The new team at Westside BMW Service were exceptional with a special mention to Shane, his people skills are faultless and Chris, for his honesty and knowledge. Over the years we have dealt with Mercedes, Audi and VW. BMW service and courtesy completely outpaces all of these companies and is one of the most important reasons we will be sticking with BMW in future. I could not be happier with the service received at Westside BMW. I have been a service customer for 20 years and have never received such excellent service from anywhere. Everyone was very professional, special mention to both Peter Loader and Donna McCrenor who were an absolute pleasure to deal with. I would highly recommend Westside BMW to any of my friends who are thinking of buying a new car. We had previously been Mercedes owners, but found no satisfaction in their after sales approach to their customers. I responded to a survey from your company and I unfortunately I made a mistake. The survey asked if my car had a service in March to which I said "no" and the survey discontinued from there. I have in fact responded to a "campaign" to fix the water coolant system which I think was suppose to mean the "service" as mentioned in the survey. I would like to say that the staff at Westside BMW have done a fantastic job in handling the "campaign", the loan car was perfectly arranged for me. I would like to rate the quality of their service as 10 out of 10. "I'd like to thank David and his service team for looking after me recently with my X1. My car wasn't quite due for a service but as I live a fair distance away he serviced it for me anyway and covered it under warranty. This is the reason we have bought 2 new BMWs from Westside BMW in the last 10 months. We were impressed with Mark in sales and now with David in service." "We will continue to come back to Westside BMW for our services and when our cars need replacing we won't hesitate in coming to Westside for our new vehicles. We also will be recommending Westside BMW to our friends and colleagues for their purchase of their new vehicles. "I recently purchased a vehicle from your dealership. I located the car via the internet & sent off an email regarding it. I was contact by Mark Korunich. I would like to commend Mark for the manner in which he went about selling me the car. At no time did I feel pressured or intimidated by Mark & quite to the contrary I believe that his professionalism & diligence helped greatly in sealing the deal." "Upon meeting Mark face to face he showed me the car & went through all the paperwork etc. His professionalism with me was only out done by his courteous nature. I would have no problem with recommending Westside BMW & in particular Mark to any of my friends & associates if they were looking for a new BMW or a quality used car that you had in stock. I felt compelled to sending this email as in the 33 years of buying cars this was my most memorable. Well done to Mark & Westside BMW." "My wife and I are so happy with the outcome of a lovely new car for our daughter. Mark and Darren were great as was Donna in finance leaving our daughter with a pleasant 1st car purchase experience." "Once again, thanks for your ongoing positive 'can do' approach to our families' BMW experience." "I have been satisfied completely with the service and the care provided by Westside BMW. I have been to 6 BMW show rooms around Australia and really only wanted to deal with Mark because he was the best at his job. Mark is the best salesman I have dealt with in the last 10 years. "He sat down and tailor made options for me to my needs (realising I am not an easily satisfied customer) and worked through them. Mark gave me options. When I was not satisfied , he again gave me more options. Never once, was there an ooopmh.. this is too hard kind of attitude. I will recommend Mark to all my friends should they choose to have a BMW or a new car. "The service from everyone at Darra was really very good, everybody really friendly and very happy with a special mention to Donna in finance for be so helpful." "I would like to bring it to your attention the great work that is going on in your service department there at Westside BMW and I would like to commend you on your professional staff. It is because of my experience with your dealership in the last 24 hours and the professionalism that was displayed, I will be coming back to your dealership from now on for all sales and servicing. "I was worried with another long weekend coming up and I can appreciate how busy the dealership would be during this holiday period that it may not even be until another week before someone could look at my car. I was impressed with the service advisor's very kind and sympathetic phone manner and very happy that someone could at least look at my car that same day. To my great relief the service advisor called by late afternoon and told me car was now repaired, being washed and I could now pick it up that afternoon. I found the advisor to be very courteous and very professional through every step of this process. 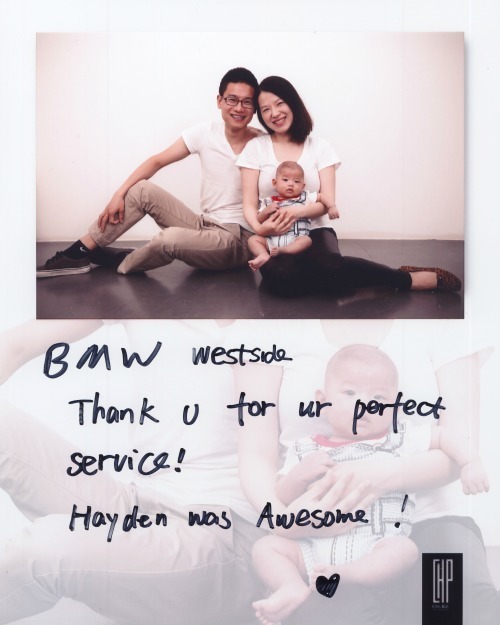 "Once again a very big thank you to the Westside BMW Service Department for getting my baby back on the road as soon as possible." "I am writing to thank you for allowing my business to use your boardroom facilities and for the excellent service your reception staff have provided to us. Our building and boardroom facilities were damaged during the flood and so we have truly appreciated the help from Westside BMW. "Westside BMW is an impressive business and your boardroom facilities have spoiled us but most importantly it is how your staff have made us feel welcome. During our last meeting one of my staff made the following remark. 'If Westside BMW is so considerate and helpful to our small business what is it like to be a customer of Westside BMW?' I thought this was a very fitting remark and wanted you to know that every time we walk through your show room we dream of good things to come." "I am always so impressed with the standard of service at all areas of Westside BMW. In fact, I commented to my son that I never get service of that level of excellence anywhere else. I think your business deserves to be nominated for a service award! Thank you so much. It is so refreshing to find this rare combination of excellent service and care for customer satisfaction. I will spread the word!" "I would like to thank you very much for the assistance you and your staff gave me in buying my first BMW. Everyone from the sales person through to reception and Finance at Westside were extremely helpful and professional. They all made me feel very special and turned it from "stressful" into a very exciting experience for me. I can understand why my friends recommended I contact your business, and can assure you that I will do the same thing if I hear of anyone looking to purchase a BMW." "I recently purchased a BMW 325i Sport from Westside BMW where I had the pleasure in dealing with Michelle Deeb and Tony Andrews. I received excellent value in the car and finance package they put together for me. Apart from the great package, I was also impressed with the level of service I received from all the Westside BMW staff members. Information and details was forthcoming and prompt, and no detail was too much trouble for them to investigate on my behalf. They tailored the delivery to suit my needs and I felt like the purchase of my BMW was a special event. Having purchased a number of BMWs interstate over the years, I am used to the quality and service one comes to expect from BMW. I was impressed to see that your team was able to exceed my expectations. I would have no hesitation in considering Westside BMW for my next BMW purchase."